A nurturing doll from Madame Alexander's Huggums Collection. 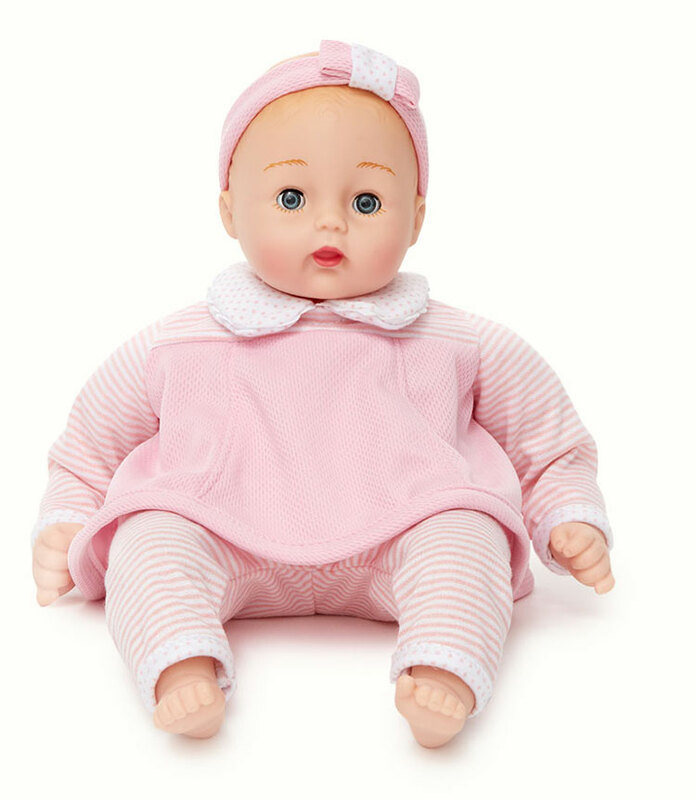 Bubble Gum Huggums is a beautiful 12 inch baby doll with blue eyes and light brown painted hair. She has a huggable cloth body with limbs and a head made of high-quality vinyl. She is too cute in her outfit and matching and headband. Bubble Gum Huggums wears a soft pink knit top and pants. Her shirt, pink textured knit with princess seams and self-binding, has a pink and white striped collar and sleeves. Her pink and white striped knit pants has a mini pink polka dot binding at the ankles and an elastic waistband. A pink knit headband with a white bow completes this little darling's outfit. Part of the Baby Alexander Collection. Suitable for ages 2 and up.